Jet Aire Services has been awarded a £100,000 contract to carry out highway works on behalf of Persimmon Homes Yorkshire. Jet Aire has commenced Section 278 highways adoption works in Sherburn in Elmet. Opposite both the Persimmon Homes and Redrow Homes sites on Low Street, the works consist of the construction of a new shared footway and cycle path along with the installation of new pedestrian crossing points, drop crossings and a new pedestrian refuge island to enable the residents living within both these developments to cross the carriageway safely. Persimmon Homes’ Ceretic Park was launched in 2015 and phase one is currently under construction, offering a wide choice of two, three and four-bedroom living. Redrow Homes are building 96 units on the latest phase at their Saxon Gardens development, including a variety of three and four bedroom living. “The contract at Low Street, Sherburn in Elmet is the latest of a range of works which Jet Aire has provided for Persimmon Homes over the years, including various professional drainage services at developments across Yorkshire, and we are delighted to continue working as key contractor for one of the UK’s leading housebuilders. Completing construction sites to an adoptable standard has become one of our core capabilities. We have developed a managed service to include liaison and inspections with both the highway and water authority inspectors, together with the production of the as-built drawings. 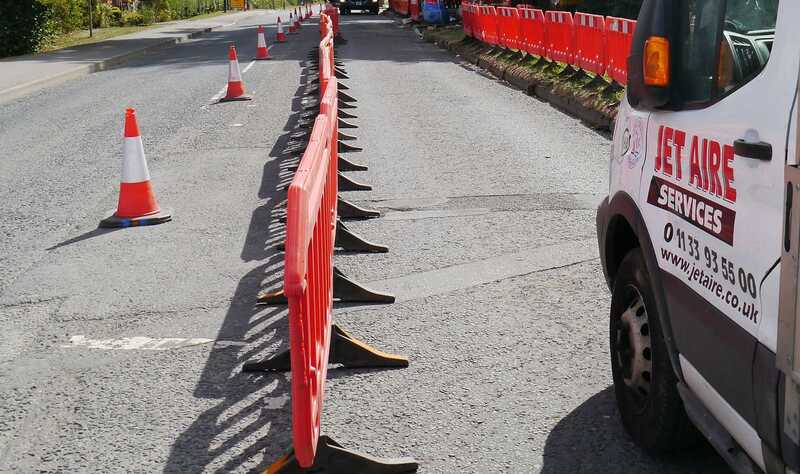 This streamlines the process, reduces costs and ensures a timely return of the client bond from highways authorities. Jet Aire’s range of professional drainage and groundworks services also includes block paving, fencing, CCTV surveys, high-pressure water jetting, tankering, waste disposal, CIPP patching/lining, UV lining, infiltration sealing, robotic cutting, root cutting and epoxy spray Ultracoating. Operating from offices in Aberford and Middlesbrough, Jet Aire Services holds all 3 ISO9001, ISO14001 & 18001 accreditations which are internationally recognised standards for quality management.